Use the matplotlib plot function to create custom plots. Add labels to x and y axes and a title to your matplotlib plot. Customize the colors and look of a matplotlib plot. Before you begin this lesson series, be sure that you’ve downloaded the data for this week of the course. 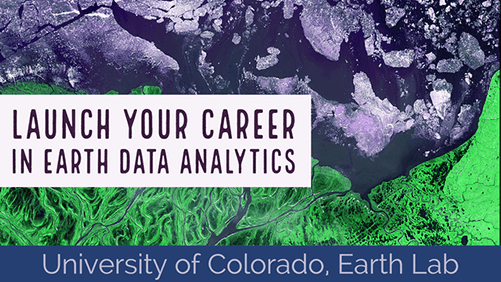 After you download the data, unzip it and make sure that is in your earth-analytics/data/colorado-flood/ directory on your computer. Your directory should look like the image below: note that all of the data are within the week-02 directory. They are not nested within another directory. Your `week_02` file directory should look like the one above. Note that the data directly under the week_02 folder. In your week 1 homework, you used the pandas plot function to plot your data. In this tutorial, you’ll explore more advanced plotting techniques using matplotlib. First, explore the code below to that was used to download the data and then create a quick pandas plot. Then the data was plotted using the pandas function, .plot(). Basic matplotlib plot with dates on the x axis using .plot(). Matplotlib is a plotting package that makes it simple to create complex plots from data in a data.frame. It uses default settings, which help to create publication quality plots with a minimal amount of settings and tweaking. Matplotlib graphics are built step by step by adding new elements. When you create a figure object you are creating a blank canvas to place a plot on. Once you add a call to plot using ax.plot - your blank canvas has a plot on it. Then finally you can refine your plot adding labels and other elements. You can customize your plot adding and adjust ticks and titles. You can customize the look of the plot in different ways. For instance, you can change the point marker type to a circle using the function argument: -o. Visit the Matplotlib documentation for a list of marker types. Here you adjust the point markers used in your plot. Adjust the ticklabels on the x-axis and create a scatterplot. You can adjust the transparency using the alpha= argument. Adjust the alpha value to add transparency to your points. Color points according to an attribute value. You can turn your plot into a bar plot using ax.bar(). When you create a bar plot you need to call .values on your data. Just like you could adjust point colors you can adjust the bar fill and edge colors. Change the fill to bright green. Here the bar color is set to green and the edge color is blue. There are many styles that you can apply to make your plots look nicer and uniform. Here a style is called within the plot code. This style will only be applied to this plot. You can add labels to your plots as well. Let’s add a title, and x and y labels using the xlabel and ylabel arguments within the ax.set() function. You can label your x and y axes as well. If you know that you want all of your graphs to have a white background, be a specific figure size and have titles, and labels the same font size the plt.rcParams function will save you some typing! This function allows you to set graph formatting for an entire notebook if it’s placed at the beginning. axis.titlesize sets the title font size axes.facecolor sets the figure background color. Here are some additional matplotlib examples and information about color bars. Here is an in-depth guide to matplotlib that will be useful for you to refer back to.